Photo by Amy Phelps The Historic Schoenbrunn Village holds special events throughout the year, like the Lantern Tour. 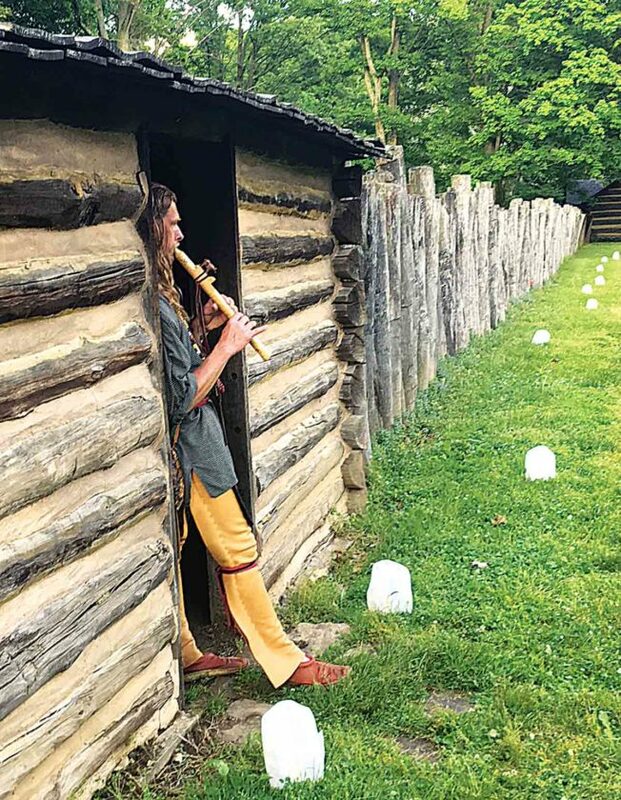 Photo by Amy Phelps A Native American plays a flute during the Lantern Tour. Photo by Amy Phelps The back of the Dennison Railroad Depot Museum shows what the trainstop might have looked like. 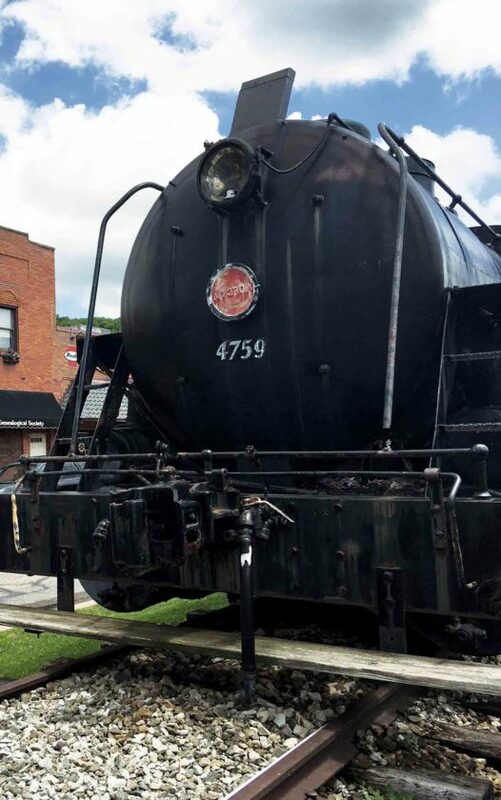 Photo by Amy Phelps A restored engine sits out front of the Dennison Railroad Depot Museum. Photo by Amy Phelps Visitors enter the schoolhouse at Schoenbrunn Village, one of the several buildings. Photo by Amy Phelps Inside the schoolhouse, costumed interpreters talk about teaching Native Americans at the site. 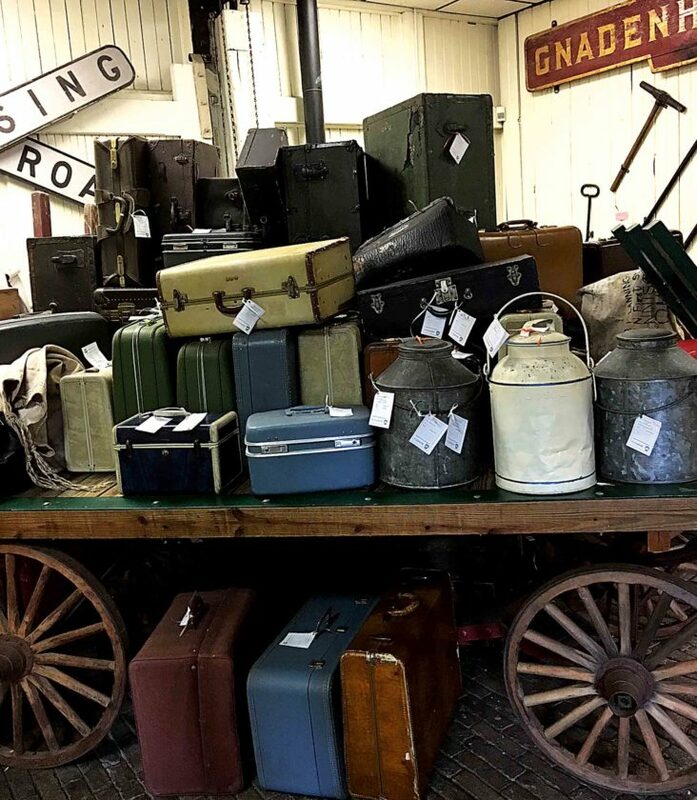 Photo by Amy Phelps The baggage car holds a variety of bags that visitors can stick a “luggage tag” on. Photo by Amy Phelps A furtrader talks in the forest surrounding the Historic Schoenbrunn Village. 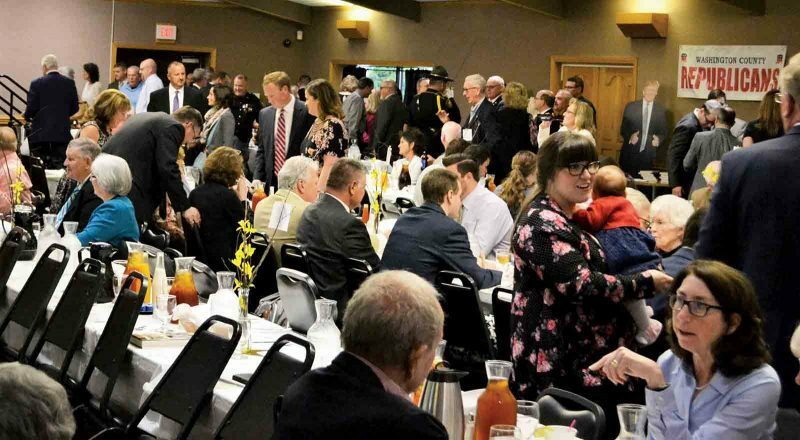 Situated north of the Mid-Ohio Valley and south of Canton, Tuscarawas County in Ohio has several small towns that are full of history to explore. 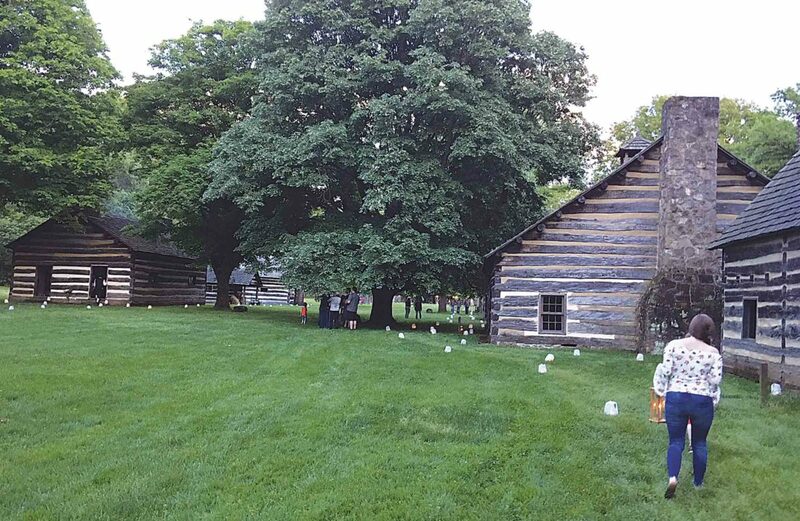 While last year’s feature explored the Bolivar-Zoar area and parts of the Sugarcreek area, this year the cities of Dennison and New Philadelphia are spotlighted with their own histories. The small city of Dennison now holds the Dennison Railroad Depot Museum. 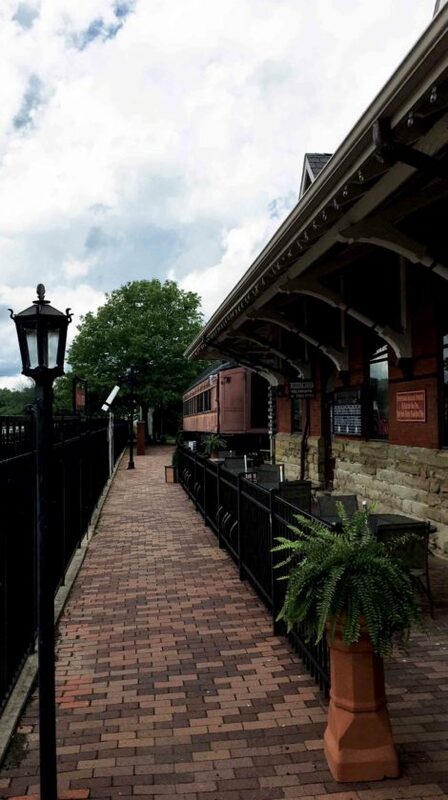 Once the depot that train cars passed through on routes from Columbus to Pittsburgh, it was founded as a waterstop in 1864. In World War II, 1.3 million GIs passed through, and was known as Dennison Depot Salvation Army Servicemen’s Canteen, which operated 24 hours a day, 7 days a week to give soldiers free coffee, donuts, sandwiches and fruit on their way. The soldiers nicknamed the area “Dreamsville, U.S.A.” and remarked how nicely they were treated there, almost like they were back at their own hometowns. The last passenger train stopped there in 1976, and since then, it is on the National Register of Historic Places and the depot and train cars there have been turned into a museum, as well as a diner and a gift shop. The museum hosts exhibits that bridge all aspects of trains and the depot, as well as the history of the war and features new seasonal exhibits each year. For kids, the museum has a “scavenger hunt” with special stops along the way, that allow children (and adults) to physically interact with the exhibit and learn more. There is a model train exhibit of the area visitors can watch, as well as a movie about its history. The various train cars are all joined together and allow visitors to explore the Baggage Room, the Railway Express Agency, the WWII Hospital Car, a Local History Car and the Feature Exhibit Car, which for 2018 is all about the state’s amusement parks. There is also a special display dedicated to Bing, the museum’s mascot, and a real dog that smuggled on board a ship in the pocket of a coat in World War I and was taken care of by members of the Dennison-Uhrichsville Company H. Bing went on combat situations, spent 58 days in the trenches and was even given citations for bravery. His helmet and cape are on display in the museum as well as several photos. The museum also offers several fall foliage rides and special programs throughout the year. About 8 miles away from Dennison is the Historic Schoenbrunn Village in New Philadelphia. 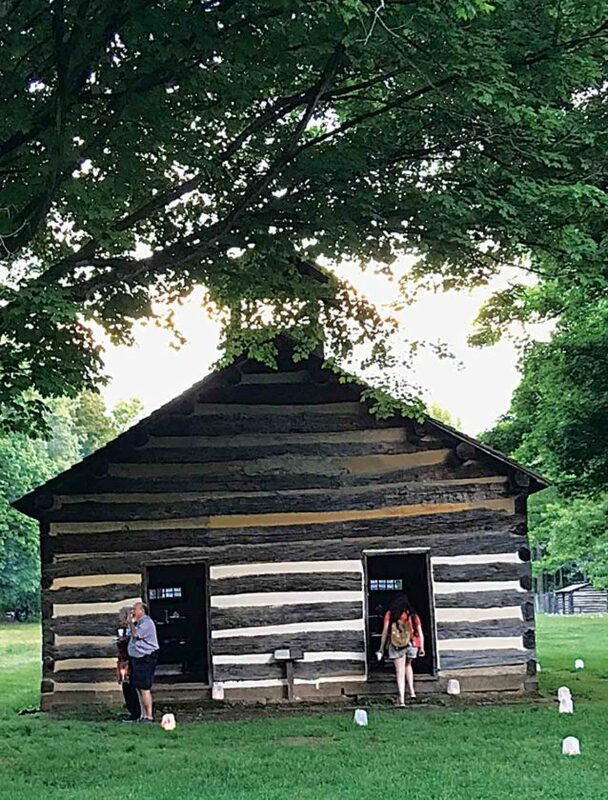 During the beginnings of the American Revolution, it was the first white settlement in Ohio and west of the Ohio River, where the Moravian missionaries lived in peace with the Delaware Native Americans, both exchanging their cultures with each other. It grew to include 60 dwellings with 300 Delawares and Moravian missionaries. 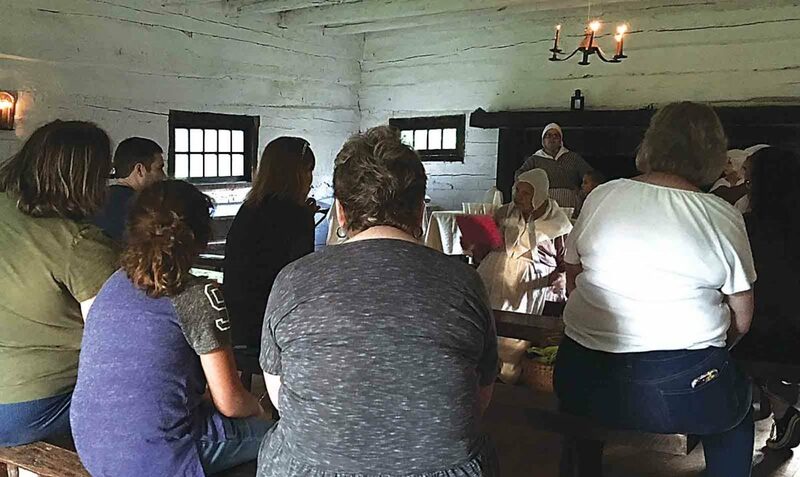 The group drew up a civil code, which can be seen inside the small museum section, and built Ohio’s first Christian church and schoolhouse. The village was abandoned in 1777 and in the 1920s, 17 of log cabins were reconstructed. Visitors can explore the cabins, school and church, the cemetery, via a walking tour pamphlet, and there is a small museum, theater and gift shop. There is also a picnic area on site. 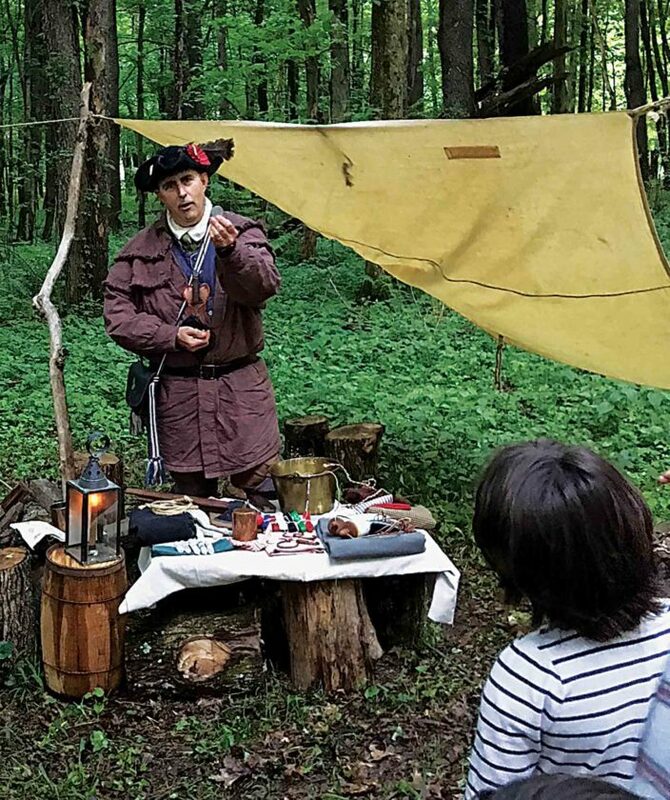 The village holds several special events throughout the year, which include a night-time lantern tour, a Colonial Trade Faire and in which costumed interpreters show how the village would have looked during colonial times. In July, the park will host its Fourth of July festival, with a parade, car show, talent show, family day and races for kids. “It’s a really great time at the park.” Leavengood Stephon said. In addition, the park holds its Summer Showcase with free entertainment in the pavilion all summer. 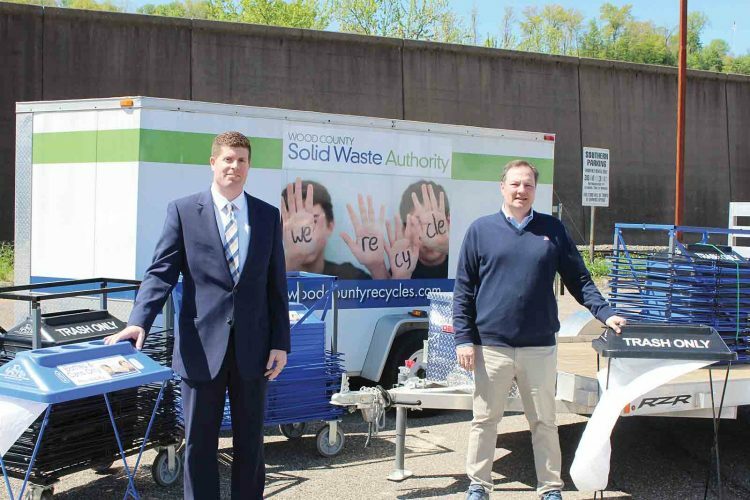 * Getting There: Tuscarawas County is about 95 miles north of Parkersburg. That is around a 1 hour 30 minutes drive via 1-77N. * Eating: The Dennison Railroad Depot Museum has a 1940’s-style diner inside, The Over the Rail Diner, and several local eateries in the city. In New Philadelphia, there are many local eateries and national chains. * Shopping: New Philadelphia has the New Towne Mall and a downtown area with several shops and Yaggi’s Cheese House. * Outdoors: New Philadelphia has Tuscora Park, with amusement park rides, pools, basketball and tennis coursts and a playground. In nearby Bolivar and Zoar (featured last year) canoeing and kayaking is available on the river. * Tuesday-Friday: 10 a.m. to 5 p.m.
* Saturday: 11 a.m. to 4 p.m.
* Sunday: 11 a.m. to 3 p.m.